Idaho, commonly known for its potatoes, has a rich mining tradition. Almost every important mineral except oil, gas and coal can be found in Idaho. And it is this rich supply of minerals that brought migrants to the state in the mid 1800s. By the 1860s, Idaho was producing 19% of the gold in the United States. With this burgeoning mining industry came services to support the miners. These services included not only banks, bakers and hardware stores, but also brewers. By the time Idaho became a state in 1890, there were at least 33 breweries operating across the new state. The brewing industry lasted in the state until the onset of Prohibition, which came to Idaho in 1916. By 1933, when the dark cloud of Prohibition was lifted, no breweries remained in the state. These days, the brewing tradition has returned to the state, and we were able to get our hands on a few selections from one of these new brewers. 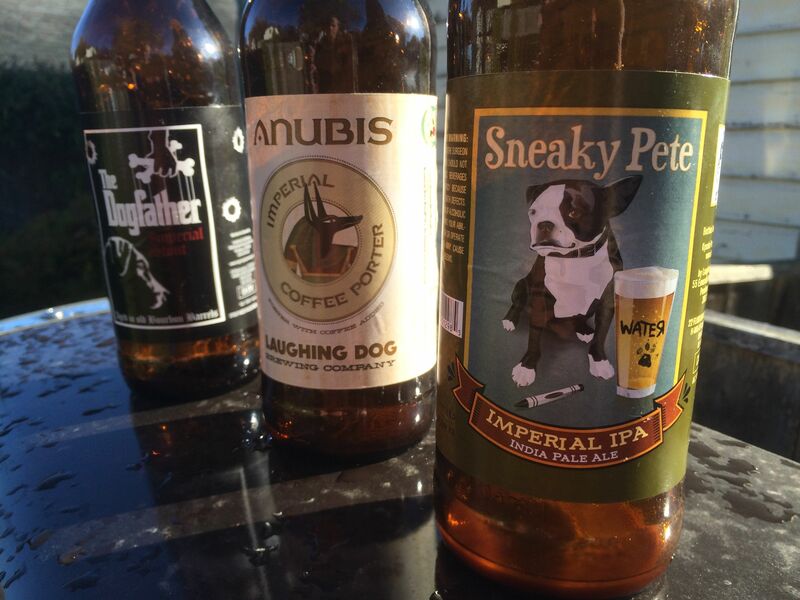 This week from Idaho, we had three different Imperial beers from Laughing Dog Brewing. This weeks selection from Idaho consisted of three Imperial brews from Laughing Dog. The first beer was an Imperial IPA called Sneaky Pete. This beer was very sweet and fruity with a bitter after-taste. What was interesting, was that for an IPA, the malt was the dominant smell, not the hops, making it unique in that respect. After the IPA, we opened an Imperial Stout called The Dogfather. This stout poured like tar, and for me, that is a good thing. I really enjoy a thick, hearty stout. This beer was dark too, almost black, and it had a sweet malty taste that reminded one of the tasters of root beer. I too got that hint of root beer, but I also tasted hints of bourbon, from the barrel aged, but the bourbon was not as strong as previous beers. The after-taste of this beer was sweet chocolate. The final beer of the evening, also from Laughing Dog was an Imperial Coffee Porter called Anubis. This beer had a slight sour smell and was much more mellow than the stout. Again, another great week was had, and Idaho represented well. Next post is Wyoming.